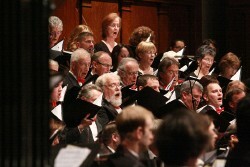 By closing their 73rd season with Beethoven’s Ninth Symphony, SSO maestro Kevin Rhodes invokes summer in at least two ways: this is how the Boston Symphony Orchestra traditionally ends its Tanglewood season; and the role of the Springfield Symphony Chorus in the last movement foreshadows the annual Berkshire Choral Festival 20 miles south of Tanglewood in Sheffield, MA, where the SSO is the resident summer ensemble. With the SSC on hand, it made sense to program not one but two more works for chorus and orchestra to precede the Beethoven, both rarely heard gems by British master Ralph Vaughan Williams. The 1938 “Serenade to Music” sets a text from Shakespeare’s Merchant of Venice and features, in this version, four vocal soloists. Soprano Elaine Alvarez, mezzo soprano Chrystal Williams, tenor Jonathan Boyd, and baritone Mark Walters joined the SSC and the SSO in a lush, radiant performance of this sublime 13-minute ode to the power of music. Though written over 30 years before the Serenade, the mystical glow of “Toward the Unknown Region,” set to a poem from Walt Whitman’s Leaves of Grass, gives it a questing contemporary quality. Conductor, chorus, and orchestra performed this 12-minute meditation on the transcendence of the “ties eternal” that follow death with rising passion, building to an ecstatic outcry of joy at the shattering climax. Intermission was followed by a blazing account of Beethoven’s symphonic masterpiece. The ominous tonality of the chords which open the massive Allegro first movement makes the piece sound as if it was written decides later than 1824, when it was premiered in Vienna. The driving scherzo movement was fleet and relentless, while the tender Adagio was flowing and luminous. In the magisterial finale, Rhodes expertly managed the tricky balance between chorus, orchestra, and the four solo singers above, all in peak form. Brief curtain-call tributes by the maestro to principal clarinetist Michael Sussman, retiring after 47 years in the SSO, and to SSC director Nikki Stoia for 30 years of service revealed a deep mutual bond among these musicians which promises more high-caliber music-making in future seasons.